The book begins by telling Flew's story. It describes how he arrived at an atheistic position, the reasoning the led him there, and some brief autobiographical details. The second half of the book consists of the reasons that led to Flew's conversion from atheism to deism. Flew lays his cards on the table stating, "I now believe that the universe was brought into existence by an infinite Intelligence. I believe that this universe's intricate laws manifest what scientists have called the Mind of God. I believe that life and reproduction originate in a divine Source" (88). The titles of the chapters in this section are telling about what led to Flew's conversion: "A Pilgrimage of Reason," "Who Wrote the Laws of Nature?," "Did the Universe Know We Were Coming?," "How Did Life Go Live?," "Did Something Come From Nothing?," "Finding Space For God," and "Open to Omnipotence." As one might guess, some of the issues that led to Flew's conversion include the origin of the laws of nature, the fine-tuning of the universe, the intelligent design of life, how to make sense of life and freewill in a purely materialistic universe, and the cosmological argument. Flew's catalog of his intellectual journey is an interesting read, and it's also informative on the history of philosophy of religion. The book concludes with two appendixes. The first appendix was written by Roy Abraham Varghese and it critiques the so-called "new atheists." The second appendix is a dialog between Flew and N.T. Wright, the prominent British theologian and historian, in which Flew asks Wright a number of questions about the self-revelation of God in the person of Jesus. This book is important on at least two levels. First, it is important because it signals that a renaissance is taking place among modern Christian theistic philosophy. The preface of the book cites a Time Magazine article from April, 1980, which says, "In a quiet revolution in thought and argument that hardly anyone would have foreseen only two decades ago, God is making a comeback. Most intriguingly this is happening ... in the crisp intellectual circles of academic philosophers." Unquestionably, there has been a resurgence of theism, and especially Christian theism, among academic philosophers. Thirty years ago, there was almost no such thing as a Christian philosophy professor at a major university. Today, Christian philosophy professors are common at major universities, and theistic positions are seen as highly respectable. God is not even close to being dead in the academy. On the contrary, He is alive and doing a mighty work. Secondly, this book is important because one man is a step closer to trusting the Lord Jesus. I remember a debate I attended in 1998 in which William Lane Craig debated Antony Flew on the question of God's existence. (This debate is available in written form as the book, Does God Exist? The Craig-Flew Debate edited by Stan W. Wallace). After the debate I remember praying for Flew. It seems that perhaps God is taking steps towards answering my prayers. Flew does not consider himself a Christian at this point. Rather he believes in God, but the God he believes in is a deistic God who does not interact with people. However, in regards to Christianity Flew states, "I think that the Christian religion is the one religion that most clearly deserves to be honored and respected whether or not its claim to be a divine revelation is true. There is nothing like the combination of a charismatic figure like Jesus and a first-class intellectual like St. Paul" (185-186). Flew concludes his book stating, "Some claim to have made contact with this Mind. I have not--yet. But who knows what could happen next? Someday I might hear a Voice that says, 'Can you hear me now?'" (158). 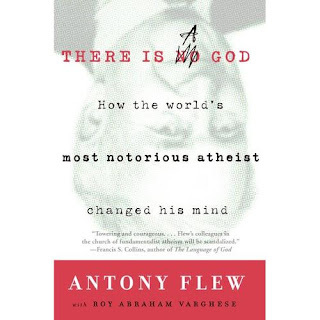 Please join me in praying that God would graciously call Antony Flew to Himself. Thanks Nige, another interesting, encouraging post. Keep it up.